Side note: When she first sent the quote back I quickly replied "didn't I send you a photo of a bicycle?" Her response, after a ha ha, was yes and that was the quote that first came to her mind. She offered another but I like how what I think of when I look at the image is very different than what she thinks of so I'm leaving it. What does it make you think of? I don't blog on the weekends so here's hoping you have a great one and I'll see you on the flipside. Like a bicycle we have within us the capacity to move forward or stop depending upon which pedal we choose to push, or lever we choose to squeeze. Sometimes the effort to be propelled forward is enormous, at other times we are able to coast along but no matter what there will be times when we can expect to fall. If ever this occurs, we all know what to do....get straight back on and start pedaling. I really enjoy these posts. Wish you a wonderful weekend! I hope you enjoy your weekend Jeanette! do you take all those photos? Very cool! And it is great to see how 2 different people perceive things. Felicity, love your thoughts as always. Yes Nicole, I take all the photos on my blog except the four lovely women posts of course. I see the ancient wall in the photo and think of the different modes of transportation that have passed the wall. For me the quote and photo are perfectly matched. I especially like the photo. What is it about a bike leaned against a wall that makes you think of where this bike has been and the possibility of where it can go. So not what first came to my mind but as soon as I started reading it, it made me look at the photo differently. That's why this series is so great! 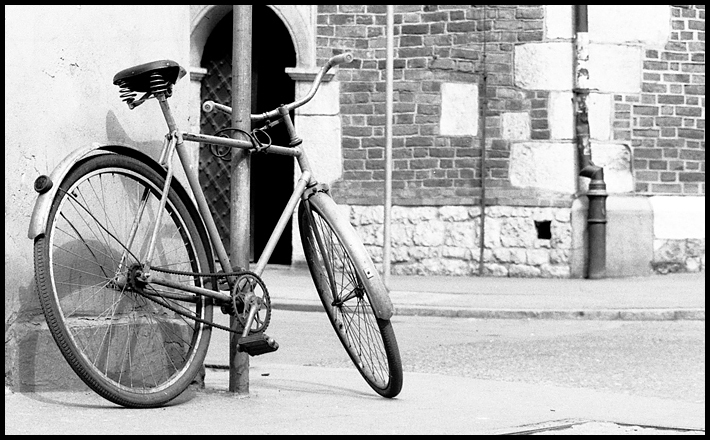 I think of Paris when I see bicycle images, I am not entirely sure why. My - I love Felicity's response! OH i love this... just gorgeous! And p.s. that book idea is GENIUS! What a sweet tradition you are establishing with your daughter. Love it. And isn't that funny? For some reason for me it instantly made sense!! Both for the movement forward and also because it looked like it might be a bike parked at university. I obviously like the way she thinks - and you too of course - have a great weekend!! Wow I think that is such a special mother- daughter thing to do!! Great post! Love the photo - think they are well paired. Makes me think of simpler times, oh and the sea side. Very nice pairing. I had to think about it a while but then I saw how the two work together. I love that there are so many different responses! Happy weekend everyone. I see a boy who wears rubberbands around his pant legs so he doesn't get yelled at for tears. love that quote by Wells. these are my favorite posts. so sweet.